Heard this advice before? It’s one of the biggest misconceptions in the exercise and weight-loss world. If long, slow, steady-state aerobics was the key to fat loss ev ery person who crosses the finish line of a marathon or Ironman would have very low body fat. This just isn’t the case. Numerous people who train for an endurance event gain weight. Endurance exercise solely for fat loss does not make sense. Your goal as an endurance athlete is to become efficient and better at running, biking or swimming. A different plan of attack needs to be used to burn fat–a more effective plan. 1) It burns calories. Hard-working muscles demand extra oxygen to help them continue working. However, lots of activities also burn calories by requiring work from the muscles-weight training, sprinting, sleeping-so no extra points for aerobic training. 2) The fat-burning zone. Yes, it exists, but it has been misinterpreted. The fat-burning zone is a concept that the body burns a greater amount of fat at lower-intensity aerobic exercise than it does at higher intensities. Actually, the body burns a greater percentage of fat at lower intensities than at higher intensities. At lower intensities the body may burn 50 percent of the calories from fat, while at higher intensities it may only burn 35 percent. 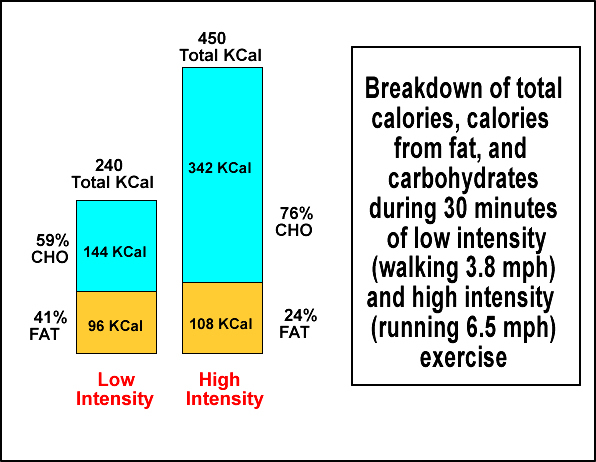 But at higher intensities you burn way more total calories-and more fat calories overall-than you do at lower intensities. 3) Aerobic training makes your body an efficient fat-burning machine. True, but this isn’t a desirable response. Yes, aerobic training does demand work from the muscles, but not as much as other activities, and it doesn’t require the muscle tissue to last, either. Because the onlytissue that burns fat in the body is muscle, aerobics are ineffective at building and maintaining your body’s fat-burning tools. 4) Aerobic training raises your metabolism. This isn’t true. Metabolism is largely a function of how much muscle you carry. Because aerobics do nothing to even maintain muscle, never mind build it, they do not contribute to raising your metabolism while at rest.